Join us as our special guest on October 23–25, 2018, with a FREE* registration to The ASSEMBLY Show. Use the discount code listed below when registering online to take part in valuable networking and educational sessions focused exclusively on assembly. This is your one-stop event to experience a resource-rich expo floor with live demonstrations and working machinery of the latest assembly technology, equipment and products. But don’t wait — complimentary registration with this code expires on 10/16/18. *FREE registration code expires on 10/16/18. Workshops not included. 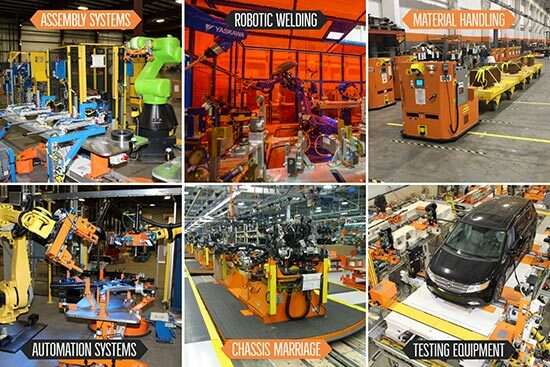 Fori Automation, a global leader in the design and build of material handling, assembly, testing and welding systems has expanded its assembly and material handling product lines. The Fori Flex Floor product line is a flexible automated material handling and assembly system that is designed to fit around the end users process and product. Traditionally, many of the other material handling products on the market require the customer process and product to fit around the material handling or assembly system. The Flex Floor platform includes automated guided carts (AGCs) based on a standard architecture, with each vehicle having varying levels of capability depending on the end users specific needs. Please visit us at Booth #919 to learn more about our capabilities and latest products!